Name your favorite chat apps and see if it’s included on Globe’s hottest unlimited chat promo. The new UNLICHAT 25 and 299 gives you free chat to all your friends on any networks as long as you are using the same app or both of you subscribed on this kind of promo. For postpaid users with unli data plan, they call enjoy unli chat and call using any IM chat apps. 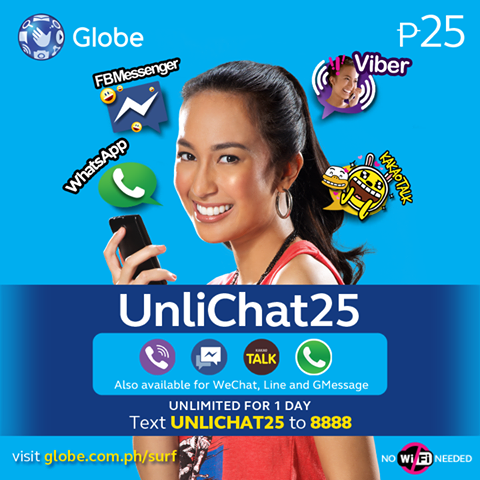 For prepaid, you can get online by one day for only 25 pesos or you can go longer chatting with UNLICHAT299 which is good for 30 days / 1 month. If you’re always using those apps listed above then you can avail this promo. No need for you to connect to a Wi-Fi hotspot to enjoy all day and all night chat with your chat mate, friends and love ones. Just register by following the format and code below. kahit kachat ko sa viber nasa ibang bansa pwede pa din? Pwede mag video call sa we chat if registered dito? Hello. Ung unlichat b n 299, pwd videocol sa fb messenger o viber?